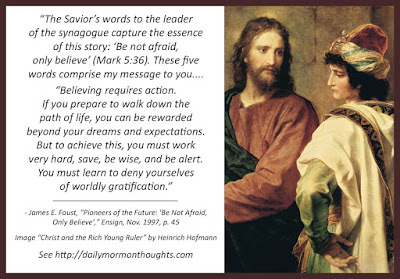 "The Savior's words to the leader of the synagogue capture the essence of this story: 'Be not afraid, only believe' (Mark 5:36). These five words comprise my message to you. 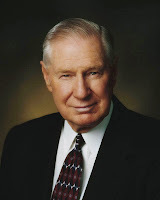 "We must believe in God, the Eternal Father, and in His Son, Jesus Christ, and in the Holy Ghost (see Mosiah 4:9). 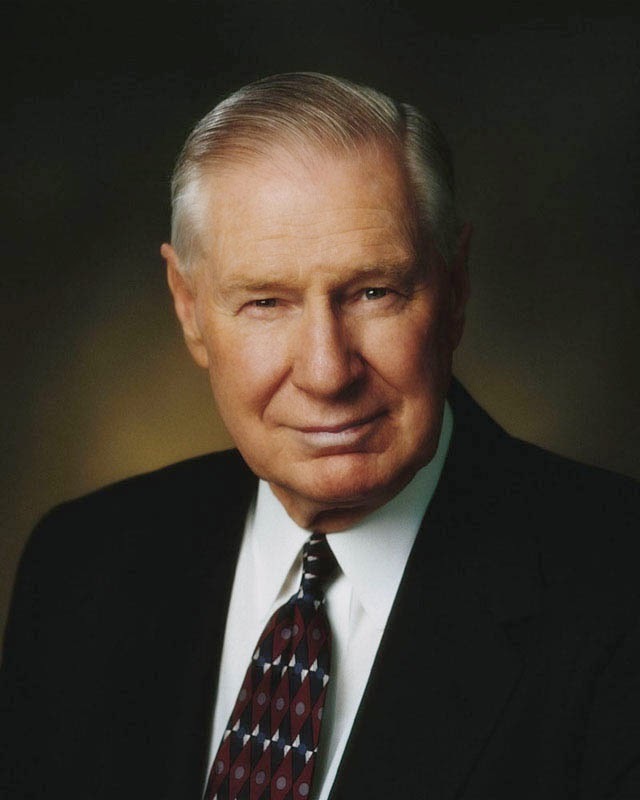 We must believe in the Atonement and the Resurrection of the Savior. We must believe in the words of the prophets, both ancient and modern. We should also believe in ourselves. "Believing requires action. If you prepare to walk down the path of life, you can be rewarded beyond your dreams and expectations. But to achieve this, you must work very hard, save, be wise, and be alert. You must learn to deny yourselves of worldly gratification. You must be faithful in paying tithes; you must keep the Word of Wisdom; you must be free from other addictions. You must be chaste and morally clean in every respect. You should accept and be faithful in all of the calls that come to you. Steadiness and toil will serve you better than brilliance." 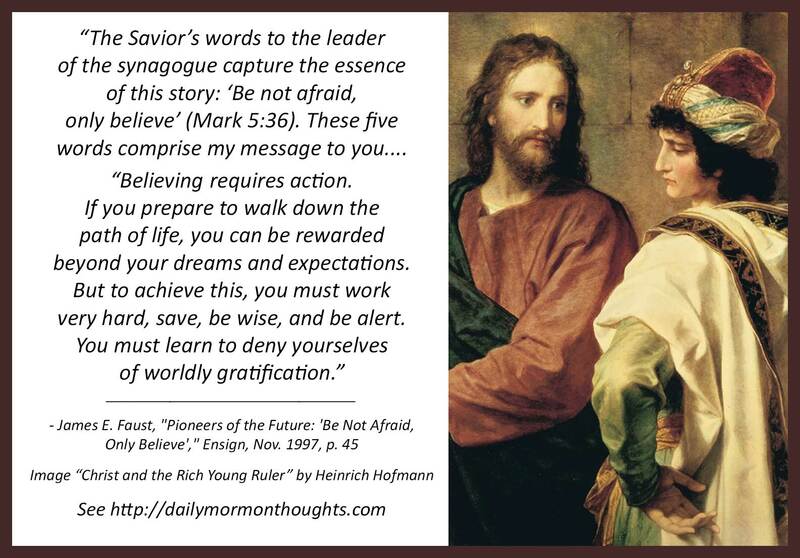 The five simple words of the Savior's admonition as recorded in Mark are, to me, among the most profound and influential of His instructions. "Be not afraid, only believe." These words encapsulate guidance for dealing with a complex and sometimes confusing mortality, and provide the essence of the message of discipleship. They emphasize the important distinction between fear and faith, encouraging us to overcome the former with the latter. If we truly grasped the full import of this simple invitation and accepted it completely, much would be clarified and simplified in our lives. Believe what? President Faust offers some suggestions: believe in God, the Savior, the Holy Spirit; believe in the power of the Atonement and Resurrection on our behalf; believe in prophets sent to represent God; believe in our own capacity to follow and find happiness. It's in the "deny[ng] yourselves of worldly gratification" that our incomplete belief is sometimes manifest, particularly as we allow those things to intervene in the actions that demonstrate true belief. The true and faithful disciple will demonstrate "steadiness" in the path, and not scattered instances of brilliance.